G.L. Huyett's MAK-A-KEY™ catalog provides an extensive selection of precision key stock for all power transmission and motion control applications in a wide range of material grades and finishes including cold finished bright steel, stainless steel, aluminum, and brass. Choose from inch and metric bar stock from 12 inches to 12 feet in length up to 6 inches square. G.L. Huyett’s new MAK-A-KEY™ key stock catalog is available now in print, and an enhanced digital format. G.L. Huyett, an ISO certified manufacturer, master distributor, and importer of non-threaded fasteners, grease fittings, and engineered fasteners, has released another new catalog devoted to precision key stock – their second in less than a year. Tim O’Keeffe, CEO of G.L. Huyett, explains, “The Key Stock Catalog we released in 2016 is a 188-page engineering-oriented resource book that includes a wide range of components for the power transmission industry. 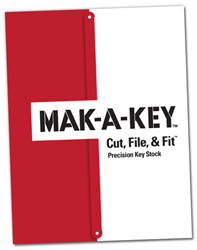 This 36-Page MAK-A-KEY™ Cut, File, & Fit™ catalog is specific to precision key stock. G.L. Huyett’s customers can choose from inch or metric bar stock in many lengths and flavors. The MAK-A-KEY catalog is available in print and can be ordered from the company’s website, Huyett.com, downloaded as a PDF, or viewed online in a new digital format. Visit http://gl-huyett.dcatalog.com/v/MAK-A-KEY-Catalog/ today to give it a try. With this new catalog release, there is another new enhancement to G.L. Huyett’s catalogs and website that is sure to be a welcome benefit for customers and visitors: Free Material Certifications and Certificates of Compliance. “We’ve worked very hard in the past year to automate and simplify this process by acquiring certs for nearly every part we sell and have made them available to our customers for download free of charge where possible. There are a handful of exclusions as we have not been able to acquire certs from a few of our suppliers, but for most of our inventory, we have both Material Certifications and Compliance Certs to the lot level,” explains Tabor. Visit https://www.huyett.com/promotions/certs/ to learn about the different types of certs available and how to acquire them through G.L. Huyett’s website. To request or download a copy of G.L. Huyett’s MAK-A-KEY Cut, File, & Fit Precision Key Stock catalog visit huyett.com/catalogs or call 785-392-3017. Established in 1906 by Guy Huyett in the “other Minneapolis,” the company is one of the oldest continuously operating businesses in Kansas. Founded on the production and distribution of machinery bushings, in the 1990s, entrepreneurial owners Tim and Carol O’Keeffe recognized huge potential in offering low order minimums, fast shipping, and expanding product offerings to a complete inventory of power transmission components including MAK-A-KEY™ and MAK-A-PIN™ precision key stock, pins, retaining rings, grease fittings and accessories, engineered fasteners, bushings, washers, assortments, and tools.